The blessed plot will be a most intriguing venue for drug and alcohol policy watchers in the coming years. The new government abounds with original ideas and fresh faces, the coalition nature of the leadership provides some intragovernmental tensions and creative sparks, and the population is dissatisfied with current policy and open to change. Herewith I begin what will be a series of posts over the coming weeks about the UK scene, starting with the new team at the Home Office. Funnily enough, on the day after the U.K. election I was in Westminster for a series of long-scheduled meetings with senior civil servants and MPs. I thus had the fascinating experience of watching the government come together hour by hour, with each meeting filled with a fresh set of rumors and speculation about what coalition might coalesce and who would get what high-ranking job. I worked in this strange twiilight for several days. The Home Office will be a critical player in drug and alcohol policy, and who would become Home Secretary was open to question after the election. Chris Grayling had been Shadow Home Secretary, but the corridor scuttlebutt on my prior visits had hinted that some in the Tory party felt (rightly or wrongly) that Grayling had â€œmishandled a few thingsâ€ and his star was falling. On the morning after the election, a senior law enforcement official wondered aloud if the next Home Secretary might be David Davis, the former Shadow Home Secretary who lost out to Cameron for Tory party leadership a few years back. A few hours later, I ran into David in the Parliament central lobby. With an air of relaxation and great cheer he said â€œI am way too independent for this lotâ€ and assured me he would not get that or any other job. I was sorry to hear this, because he was raised by a single mother in a housing estate and I would like to see someone somewhere in this government who understands deprivation first hand rather than only having read about it at Eton or Oxford. When the announcement came that Theresa May would be the new Home Secretary, the response in some quarters has a disappointingly sexist cast. It was brought up that she had once been voted â€œmost fanciable MPâ€ and one of the major papers (I think it was the Telegraph but donâ€™t quote me) printed her photo at 4 times the size of that of every other new member of the government. And there were the usual grumblings that her gender is her only true qualification. The new Home Secretary (whom do I not know personally) should be judged on her policy decisions and nothing else, and so far she has done well on the area where I feel qualified to make a judgment, namely in articulating a new direction for alcohol policy (more on that in future posts in this series). 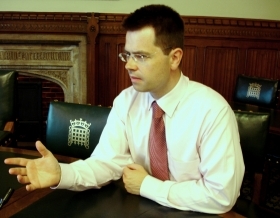 A critical junior appointment in the Home Office has gone, wisely I think, to James Brokenshire. Brokenshire (pictured at right) is now Under Secretary of State for Crime Reduction and is one of the rising younger Tories who have the potential to take the party away in substance and style from the Sir Nicholas Winteron-types who consider the working class a different species from which the rich have the right to be insulated. Many people in and around the Home Office have already become impressed with Jamesâ€™ intelligence and command of details, which – based on my experience of him prior to the election – is well warranted. I expect good things. The other basis for a vigorous alcohol and drug policy at the Home Office was there before the election. There are many informed, highly skilled civil servants with a drug and/or alcohol remit in the Home Office, which is significant given the powerful role that civil servants play in the U.K. relative to the U.S. (â€œYes, Ministerâ€ was a documentary, not a satire). They know a great deal and can help make the new policy work. Sir Humphrey was twenty-five odd years ago, whereas your post implies that you're in The Thick of It. who consider the working class a different species from which the rich have the right to be insulated. People like David "I married a millionairess" Cameron? "Yes, Minister" was a satire – based on close observation and inside knowledge, so truer than many a documentary. I believe it found an appreciative audience in Saudi Arabia; the tensions in the relation of leader to aide are much older than democracy. A good early test of the new government's willingness to look at the evidence will be its treatment of David Nutt, the former head of the Advisory Council on the Misuse of Drugs, sacked a year ago by the Labour government for straying off message. Next Next post: Good News or Grasping At Straws?